How big do you think your fanbase could get if your music had access to over 9000 music resources like Radio Stations, journalists, labels, publicists, and managers? Well, it is totally possible using a resource called the Indie Bible. I am going to tell you all about it from a few different perspectives in the review. You get a unique perspective of someone [me] who is both a musician and music blogger/podcaster (and I can even throw in marketing consultant). After experiencing the Indie Bible from a blogger/podcaster perspective for a few years now, I laid down the cash and read it as a musician who’s looking to promote his music. I have been digesting this bad boy for about a few months now and I can’t believe the info in here. 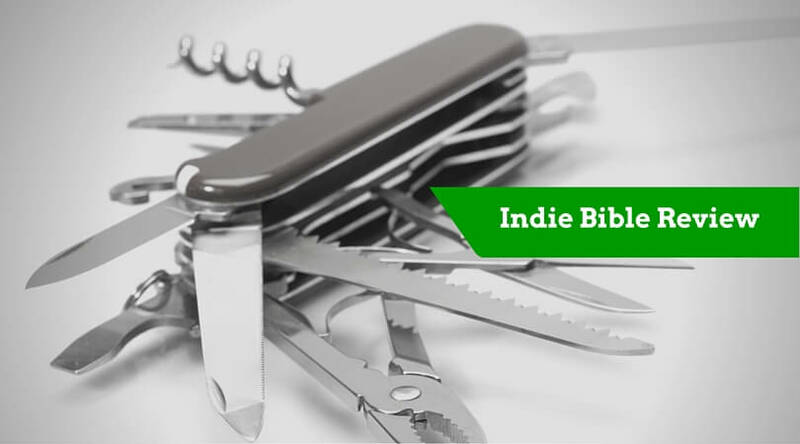 For the indie artist, the Indie Bible is the Swiss Army knife of music promotion. In other words, it is pretty damn handy! The book is a great resource which provides over 9000 resources in a variety of ways: Radio Stations, journalists, labels, publicists, managers as well as providing a healthy dose of articles from industry guru’s to help you use the resources to the best advantage. The whole thing is divided up by genre, label, radio, publication, region, etc. This is a huge time saver. You are able to really hone in on your the resources that are specific to both your style of music and region of promotion. You do not have to spend hours sifting through a ton of non-related info to find the resources you need to tap. Info packed articles by indie music guru publicist Ariel Hyatt, CDBaby founder Derek Sivers, and many more. It makes no sense having all this publicity if you don’t know how to use it. “Building A Music Site That Sells: Promote Your CD Not Yourself” (one of my favorite), and on and on. This information alone is worth the price of admission. The Indie Bible does a great job of putting together ads that compliment the rest of the content and serve the ultimate purpose of the book – providing a thorough and helpful resource for indie artists. No booze or get rich quick ads in these pages. From a Bloggers/Podcasters perspective, I can tell you that the Indie Bible works as advertised. I get tons of email and tons of snail mail from artists, record labels, and publicists – in many different genres – all over the world. Obviously, every artist doesn’t get covered but each and every one gets fair shot at coverage AND has direct access to me in order to follow up or establish a relationship. So there you have it, a quick and dirty review of the Indie Bible. I highly recommend you get yourself a copy if you are serious about getting the word out about your music. There is no way in hell you would be able to assemble all of this info on your own – you’d be nuts for trying. Besides, you have better things to do with your time, like write and play music. Click here now to get Indie Bible. Just so you know, I do get a small kickback if you should decide to buy The Indie Bible using a link on this site. I want to thank you for the support. I am an indie artist myself and I will use the cash generated as another revenue stream to cover some of the costs associated with being an indie artist. Rest assured that you are supporting a fellow artist and keeping it in the indie family.